On a larger than usual plot within the prestigious gated community of Heritage Harbour, this 3 bedroom / 2 bath villa has its own heated pool offering great South / South West lake views and of the challenging 5th hole of Stoneybrook Golf Course. Located just off Interstate 75 exit 220, the development borders the Manatee River and is a short drive from the powdery white beaches of Bradenton, Anna Maria Island and Sarasota. The many attractions are also easily accessible ie Busch Gardens / Adventure Island (40 minutes) and Disney / Orlando (80 minutes). For the shoppers bargains are to be found at the nearby Ellenton Prime Outlets with the more exquisite shops, cafes and fine restaurants at St Armands Circle, Sarasota. Needless to say, there are numerous golf courses within 10 � 15 minutes drive all of which are of a high standard and incredibly good value. This area is definitely a golfer�s paradise ! 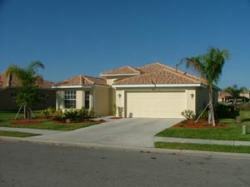 The villa has full air conditioning / heating, is spacious and airy and features many upgrades. There is a large central lounge area with fully fitted open kitchen / breakfast area, dining area, den, laundry room (washer & dryer) and 2 car automatic garage. It features a 35� wide screened lanai / pool / deck which is ideal for swimming or just lazing around watching the plentiful lakeside wildlife and golfers struggling to tame the tricky 5th hole. 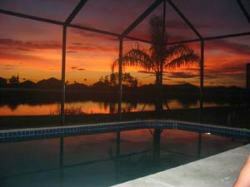 Pool heating is available at a very reasonable rate. The Master Bedroom - A large room overlooking pool / lake / golf course with a Queen Size bed, En-suite bath, separate walk-in shower room and closet with plenty of hanging space. Patio doors lead directly out to pool area. 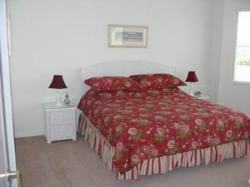 Bedroom 2 - Another large bedroom overlooking front garden with Double bed and walk-in closet. Next to shared bathroom. Bedroom 3 - Twin bedded room with separate cupboards off of main lounge area. Den - Nice open plan den with 35" TV / DVD overlooking pool / deck. Patio doors lead directly to pool area. Broadband Internet access is available as well as free local / National telephone cals within the USA & Canada. Par 72 (18 hole) Stoneybrook Golf Course, Fitness Centre, Aerobics Studio, Junior Olympic Sized Communal Swimming Pool, Baseball / Basketball / Soccer Facilities, In-Line Skating Rink, Walking / Jogging / Cycle Tracks, canoeing / Boating / Fishing Lake, Childrens Playground, Picnic Area ��. and even a library ! Too many to mention! There are 4 within 5 minutes of the villa each of which is well worth playing and has plenty of wildlife to look at if all else fails! 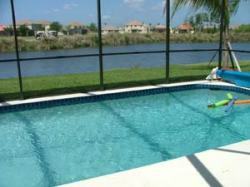 Stoneybrook Golf Course - You�re on it, the villa overlooks a lake & the challenging 5th hole. A real test of golf played through mature �Preserve� landscape, lakes and ponds. River Strand Golf Course - A recently completed Semi � Private course within Heritage Harbour . Is proving very popular �.. and a real test! The Links at Greenfield Plantation - A good public course just down the road with open fairways but plenty of water / out of bounds. Waterlefe - An absolute must ! It really is a challenge for all levels of golfers offering 5 sets of tees. There are some unforgettable holes carved alongside the scenic Manatee River.